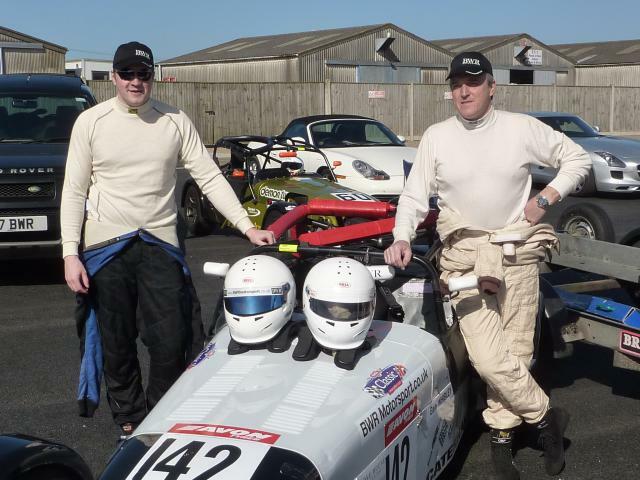 In early 2011, Ben Whibley decided to launch his own race team of 3 cars and drivers, with full team support. 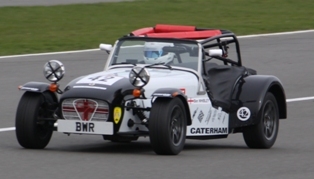 Team BWR has expert support and entering the Caterham Supersport Team Championship. The versatile name of BWR carries the first letter of each driver, Gary Burke - Ben Whibley - John Reid. 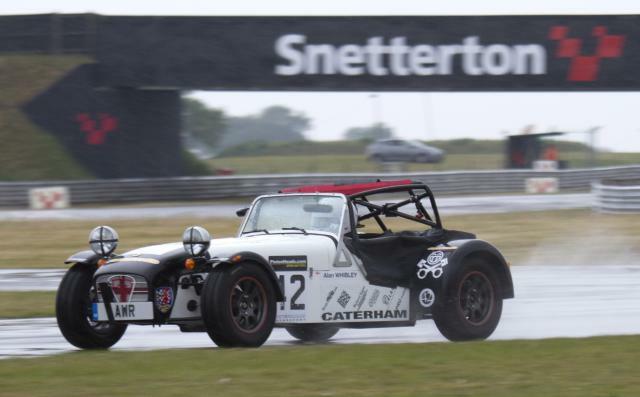 The Caterham champion Ben Whibley partnered his dad, Alan in the Classic Sports Car Club Magnificent sevens endurance race at Snetterton at the weekend. On the brand new revamped circuit the two drivers shared a Caterham supersport car and had to practice very quick driver hand over so they did not loose the race in the pits! In their first attempt at this race series, qualifying went well in very hot and sunny conditions and the pair qualified second overall in class. Alan drove the first stint but after a serious crash when several cars collided the pace car was called out and the race continued behind the pace car. Eventually the red flag came out and the race was stopped. Freeing a trapped and injured driver took the expert emergency teams so long that the race was cancelled. The driver suffered cracked pelvis but will be back in action soon. After a disappointing event Ben Whibley will be back with BWR Motorsport and competing again at Snetterton over the Easter break in the Supersport series. Ben Whibley from Tonbridge was at the opening race of the season at Silverstone. Competing on the full Grand Prix circuit in the Caterham Supersport championship. The field this year is bigger than ever with 38 drivers competing for glory. Ben is part of a four man BWR Motorsport team of Drivers including his Dad who will be doing endurance racing with Ben. The first race was a disaster for Ben his steering was broken when he was hit by a car which had lost control. He limped back to the pits but was relegated to the back of the grid for race two. By the time the race restarted Ben's mechanics had rebuilt the steering and with 38 cars in front of him a dramatic drive was called for. In the brilliant sunshine Ben had picked up 10 places in the first lap and then made steady progress up the field and was soon in the top ten and up against the best and most experienced drivers in the race. With dogged determination he picked them off one by one until the last lap when he was in third and just a split second from the leader. In some last corner antics between the top four cars Ben was shuffled back to fourth just missing the podium. But having over taken 38 cars he was delighted with his performance and confident of taking podium finishes through the season. Ben is sponsored by local Law firm Warners LLP and Grove House Publishing and are both delighted with his progress. Ben's team mate John Read finished 9th after another great drive and another local man Jeremy Webb finished second and seventh with a pair of superb drives. 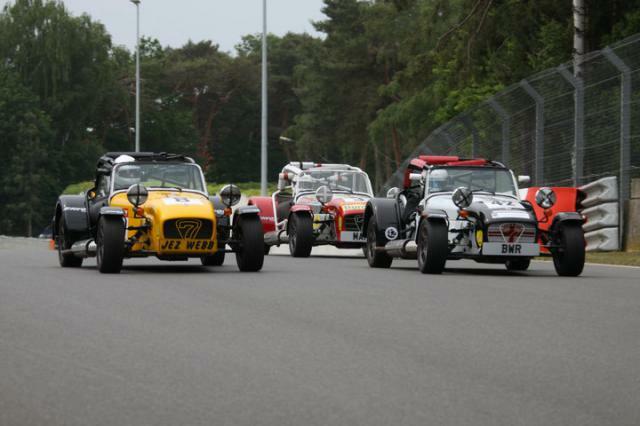 The climax of the Caterham Roadsport championship was held at the Norfolk race circuit of Snetterton this weekend. Ben Whibley of Tonbridge has been in the top three of the championship table all year and was looking to repeat his championship win in 2009. He was on track to achieve his ambition until a wild card entrant crashed into his car relegating him to fifth and with little time left on a wet track to regain the lost places and despite taking the fastest lap he had to settle for a fifth place finish. Another Tonbridge man and one of Ben's main rivals had an even worse result and finished eighteenth. In race two Ben stormed to the front of the pack until he was joined at half race distance by Jeremy Webb who had a brilliant drive from the back of the grid to catch the front runners. Along with another title contender, Midlander Reece Somerfield, Ben and Jermy pulled away from the field as the weather changed from rain to sunny but tricky conditions. On the final lap it was difficult to separate the trio but Jeremy triumphed and took the title at the same time by one point. Ben finished joint third on points. Alan Whibley gets 5th and 6th at a damp Snetterton "winter series"
Ben’s Dad Alan, followo from a successful year in the Caterham Academy 2010 to take part in the Winter Series. 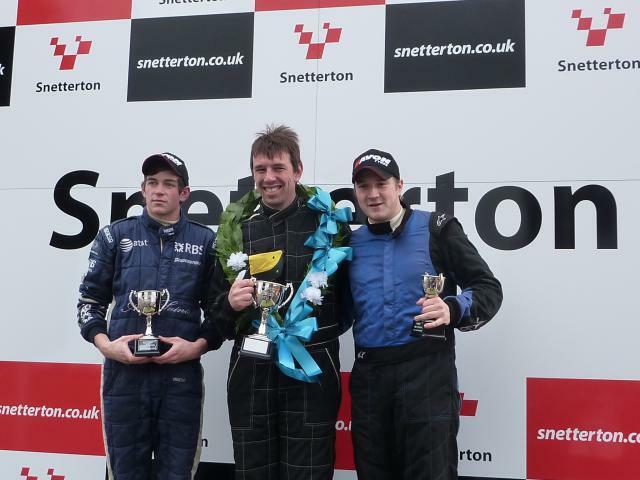 Last year both races won by Ben, Alan put in to impressive drives for a 5th and 6th place in tricky damp conditions. The penultimate round of the Caterham championship was held at the attractive and rolling circuit of Oulton Park at the weekend. Ben Whibley (29 of Tonbridge) was expecting to narrow the gap to the championship leader following his high speed crash at Brands Hatch a few weeks earlier. Ben had an excellent qualifying session and took pole position. The start lights failed and the race started with a flag but in the confusion Ben slipped to 7th. He fought back and took fastest lap as well as the overall lap record in his attempt to take the lead. However following some aggressive driving from competitors which caused questions from the stewards Ben finally finished 5th. He remains on track to take the championship but will need a win in the final round at Snetterton and poor finish from his nearest rival to take the championship. Ben Whibley of Tonbridge, Kent is still on track for the Caterham Roadsport championship despite a difficult weekend at Rockingham speedway in Northamptonshire. Languishing in 14th for most of qualifying with gear box problems and loose wheel nuts! he managed to grab 5th slot on the grid. Salvaging the weekend with a 4th and a 6th place. However an excellent drive from Jeremy Webb also from Tobridge secured him two wins with a strong drive in the first race when he opened a good lead and in the second, having just lost the lead regained it on count back when the race was red flagged due to a crash on Rockingham's high banking. Ben is third in the championship just two points behind the leader with Jeremy Webb in fourth. You can catch the action live on Motors TV this Saturday. In the Caterham Academy Gp1 race Ben's dad, Alan who is racing to raise money for the Demelza House children's Hospice had a difficult drive avoiding loose tyres rolling around the track and spinning cars to finish 19th in a packed and enthusiastic grid. 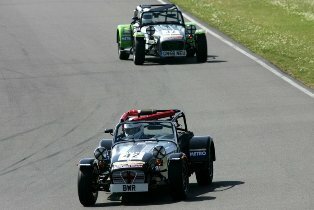 Ben Whibley 2009 Caterham Champion, 28 from Tonbridge, Kent has won his first race at an international event at Zolder in Belgium. Racing in the Caterham Roadsport event at the world famous motor racing circuit he qualified on the front row of the grid for the first race of the day. The tightly packed grid accelerated away at the start only to make the crowd gasp as half a dozen cars collided at turn one. Ben ahead of the pack with a great start was clear of the mayhem and apart from a brief spell in second place led the race taking the chequred flag in blisteringly hot conditions. Ben said" It was a very hard race and temperatures in the car got so high it made it painful to accelerate and brake hard!". An oil spill on the very last corner nearly ended the race for Ben but he managed to save the inevitable slide to stay in front. In race two the action was no less thrilling and packed with action as four cars diced for the lead for the duration of the race. A brave last lap move saw Ben grab another podium slot. The eventual winner of race two was Jeremy Webb who also lives in Tonbridge and came from fifth on the grid. Delighted with his result he was cheered on by his wife and are expecting a double celebration as they await the arrival of their first baby. Ben is sponsored by local company Grove House Publishing and will be supporting him at the next race at Rockingham speedway, Corby in early July. Ben is currently in second place in the championship just 4 points behind series leader Lee Wiggins. Ben Whibley 28 from Tonbridge was last year's Caterham Academy winner. 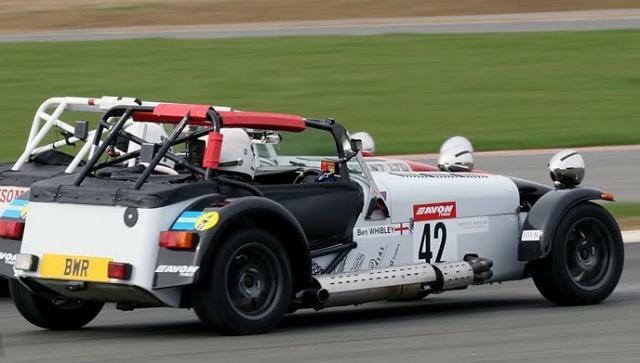 He has moved up a league this year to compete in the Caterham Roadsport B championship. As well as competing at the UK's most famous race circuits such as Brands Hatch, Silverstone and Oulton Park the series goes to Zolder in Holland in June for two races. Ben successfully started the season from the front row of the grid at the recently upgraded Silverstone circuit, on April 10. Following a tense race he finished second after a very impressive drive in front of some very stiff competition. In the second race of the weekend he led the race until half way when an over ambitious overtaking attempt by another competitor pushed Ben wide and dropped him to 7th. He fought back to challenge again for the lead only to be crashed into by a fellow competitor who was later given a penalty following a stewards inquiry. Ben is now 5th overall in the championship but still very much in contention. The old man joins in! Ben’s Dad, Alan is a member of the Old Farts racing club, (president Stirling Moss) and following a year spannering, tea making and lap timing for Ben thought he should join the action. His real aim is to raise money for the Demelza House Children’s Hospice buy getting sponsorship at a £1 a point. He will be racing in the CaterhamAcademy series but does not expect to match Ben’s success and expects to be the series chicane! To help raise cash for the charity see either Ben or Alan at one of the race meetings – or if competing against him - stay behind him to maximise the amount raised…..jeh very likely!!! 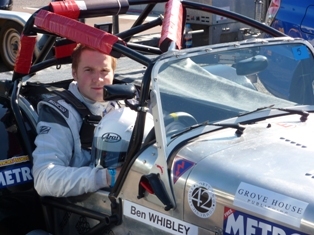 Ben Whibley was presented with an award from the British Automobile Racing Club (BARC - "Big Night Out") for winning the 2009 Caterham academy series at an awards dinner at the Copthorne Hotel in East Sussex. Along with a host of 2009 champions from across the world of motorsport including F1 World champion, Jenson Button and BTC Champ, Colin Turkington. The evening was hosted by the Earl of March owner of the much admired Goodwood Festival of speed and Revival meeting. Ben was presented with his award, an engraved crystal decanter and glasses by the president of BARC who said that Ben was clearly one to watch for the future. Ben drove to the event direct from a practice session at Castle Combe race track changing his race suit for a Black Tie. The new season opens on April 10 at Silverstone where he will be start his campaign to try and win the 2010 Roadsport B championship. Having recently wrapped up the 2009 Caterhan Academy Championship Ben Whibley, 28 of Tonbridge competed in the Winter series at Snetterdon last Saturday. The competition has been referenced at recent F1 Grand Prix coverage as the gritty end of Motorsport. Mist and rain greeted the grid as they went out for qualifying. The wet and slippery track was treated with great caution and many competitors found staying on track impossible! Race one started with excitement as Jez Webb also from Tonbridge leapt to the front of the pack but spun into the tyre walls on lap one. After exchanging places for a few laps Ben was rammed by Lee Wiggins with some very enthusiastic driving. With only superficial damage Ben finally pulled away with smooth drive to take the first win of the day. Ben continued his dominating form in the second race in even worse weather taking the chequered flag from Lee Wiggins in second and Steve Day in third. Local race driver Ben Whibley (28) of Tonbridge needed to beat his series long rival to take the championship in the final race of the series that concluded at the scenic Leicestershire race circuit of MalloryPark. Ben grabbed a spot on the second row of the grid in qualifying whilst his main competitors Lee Wiggin took fourth and Jeremy Webb also of Tonbridge was on the front row. The leading quartet immediately pulled a gap on the rest of the field and were swapping places many times on each lap. During the entire race the four leaders were never more than a few cars lengths apart. Jeremy Webb was first to spin but fought back to catch the leaders. 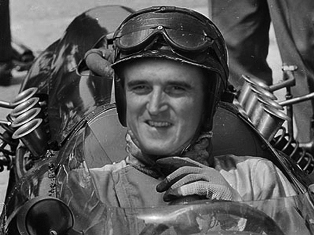 On the seventeenth lap Lee Wiggin spun at the famous hairpin bend. Jeremy pushed on to take the win whilst Ben knowing with Lee out he had secured the title followed the leading due home in third less than a second behind. Ben was absolutely delighted to win the championship after a long journey that started at a wet and cold Castle Combe meeting in February. He said he always felt he could take the title but can’t wait to do the same again next year when he sets up to take on the Roadsport B championship. Ben Whibley current points leader in the Caterham academy race series organized a Fund raising event at the World Famous Silverstone race track. Ben, from Tonbridge gave on track tuition and drove the fundraisers on "hot laps" of the famous Grand Prix Circuit. Surprising the passengers as he overtook Ferraris in his 1600 Caterham! 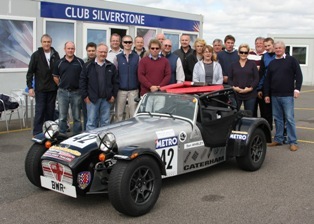 The Group of 20 enthusiastic racers had expert tuition from Caterham Cars Ltd who gave their time and expertise to help the group get maximum track time and develop their driving skills and provided excellent hospitality and refreshments. The group raised over £1000 for Demelza House Children's hospital for Children with life limiting illnesses. Ben's sponsors, both local businesses, Grove House Publishing and 42 Communications were also on hand to help and look forward to organising another motor race fund raiser again next year. Photo by Dr John Laycock, ex fighter pilot, photographer and international motor racing instructor who also gave his time to help on the day. Local race driver Ben Whibley had to pull out all the stops to maintain his position as joint top of the leader board in the Caterham Academy at Brands Hatch at the weekend. The drama started on Friday practice when a fellow competitor lost control at the famous Paddock hill Bend and hit Ben's car wrecking two wheels and some bodywork. The damage was repaired only for Ben to have serious problems with his brakes which continued to hamper his practice sessions. In qualifying Ben managed to get fourth place on the grid his worst position of the year. To make matters worse when the red lights went out and the race started he had a problem with the gearbox stuck in third and dropped to 15th! The race had to be re started following a horrendous accident that saw several cars badly damaged and one of the competitors, Mark Greenlees had to visit the medical center. Thankfully he was not badly hurt. When the race restarted Ben fought his way back to the front beating the lap record on the way. He finished second 1.5 seconds behind winner Lee Wiggins. Ben shares the top slot on the table with equal points with Lee with just one round to go at Mallory park in September. Another local man Paul Brennan won the Carterham Roadsport event earlier in the day after another titanic drive. The championship moves to local track Brands Hatch on August 15 and 16th. You can also catch the action on Motors TV. Ben Whibley 28 of Tonbridge took second place at Lydden hill on May 30 which took him to joint top of the table. He followed that by another hard won second place at Anglesey North Wales last weekend, June 27/28. The previous day he took pole position with an excellent drive ahead of second place man Lee Wiggins but by a good margin over the rest of the field. In very hot conditions Lee and Ben fought a race long dual interrupted for 3 laps when the pace car was deployed following an accident between several other competitors. A fast two lap dash when the pace car went in saw Ben finish close behind Lee to take second but enough to give Ben a 2 point championship lead. You can catch the action on Motors TV and an interview with the lead drivers and see Ben in action again at Brands Hatch on August 16 and 16. Attached Pic Ben Whibley in his 1600 cc Roadsport Caterham sponsored by 42 Communications and Grove House Publishing. The Caterham Academy racecar series comes to the Kent Circuit of Lydden Hill, nr Canterbury this weekend. The very friendly and pleasant circuit has excellent viewing areas from which the public can watch the excitement. Spectators can watch Kent born and bred Ben Whibley, joint top of the table with 38 points from the last two events try to grab the top spot. At the last event at Pembrey, South Wales Ben very nearly failed to get on track when an electrical problem stopped the car from running. Quick and efficient work by the Caterham support team got him back on track in time to grab second spot. Ben, 28 lives in Tonbridge. You can see more of Ben and the Caterham race series on Motors TV. He is sponsored by local companies 42 Communications Ltd and Grove House Publishing as well as Metro and Motors TV as part of the series sponsorship.